One of my favorite days of the year. We'll sit around the table as a family and hold hands and pray for those who need our prayers and give thanks for our amazing gifts....count your blessings and give thanks! So this summer on my journey around the Midwest, I caught up with my cousin Joyce and her husband Alain from Canada. At our many cousin reunions over the years I had met their children, but we haven't had a reunion in years. 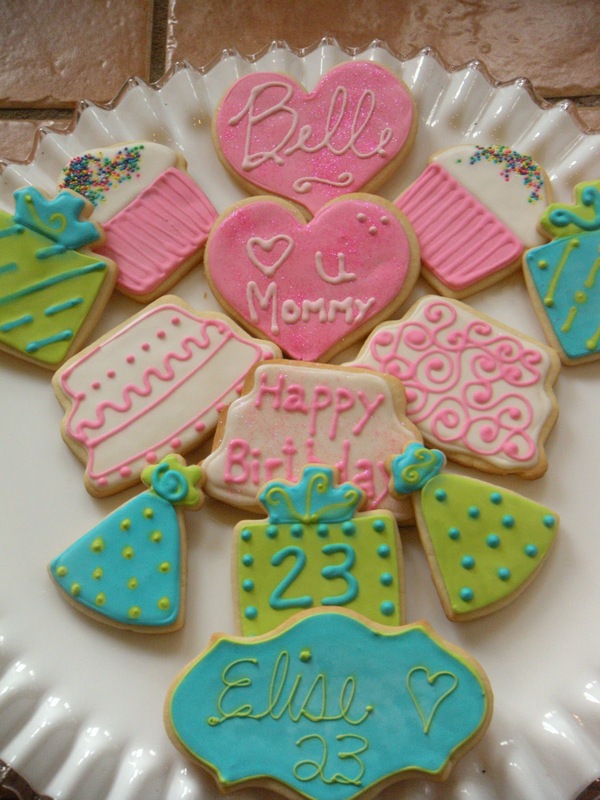 So when Joyce asked me to send cookies to her daughter, in graduate school I said sure, but where did the time go?! She originally wanted something that would reflect Elise's love of Chinese Art and Antiquities, so Joyce got lost on the cookie cutter web sites, "Who knew?" was her response! Tell me about it, it is amazing what is out there. But no Chinese soldiers or Buddhas, so we went with the more traditional birthday fare! So volleyball has finished, and work has begun! Tis the season, and things really ramp up at work, so life takes a different twist! I have been baking pretty regularly, and have a few cookies to share. 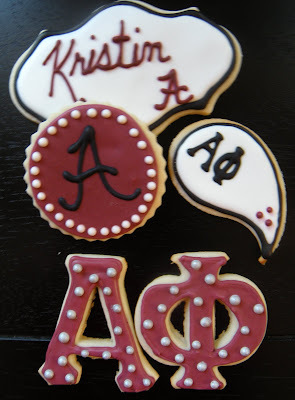 First some Alabama Alpha Phi cookies for a neighbor. Then I helped out with the Chi O bakes sale fundraiser. I did some Chi O cookies and I wanted to make the blue swirl cookies to be like the Make A Wish star, but they aren't pretty enough to share...of the dozens I made I shot a picture of a bad one! The cookies were pretty simple, I made a lot, hopefully they raised some good money for a great cause! I have been buying up the Greek letters for the sororities and frats, and some of them I dislike in a mean way. That omega (farther down) is a real beast to unmold, and the design is thin and fragile after baking. 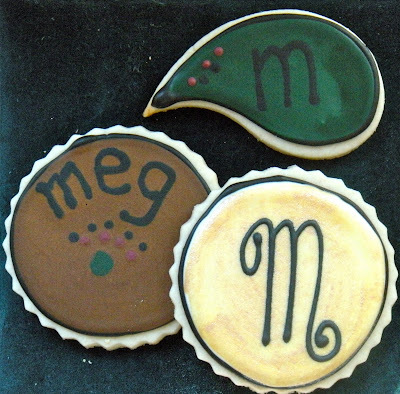 I opted for some fat letters from an old set, since these particular cookies were in a bake sale, I knew fragile would not be good! And then I did a few birthday surprises. An 18th for my friend's daughter who was almost a Halloween baby! 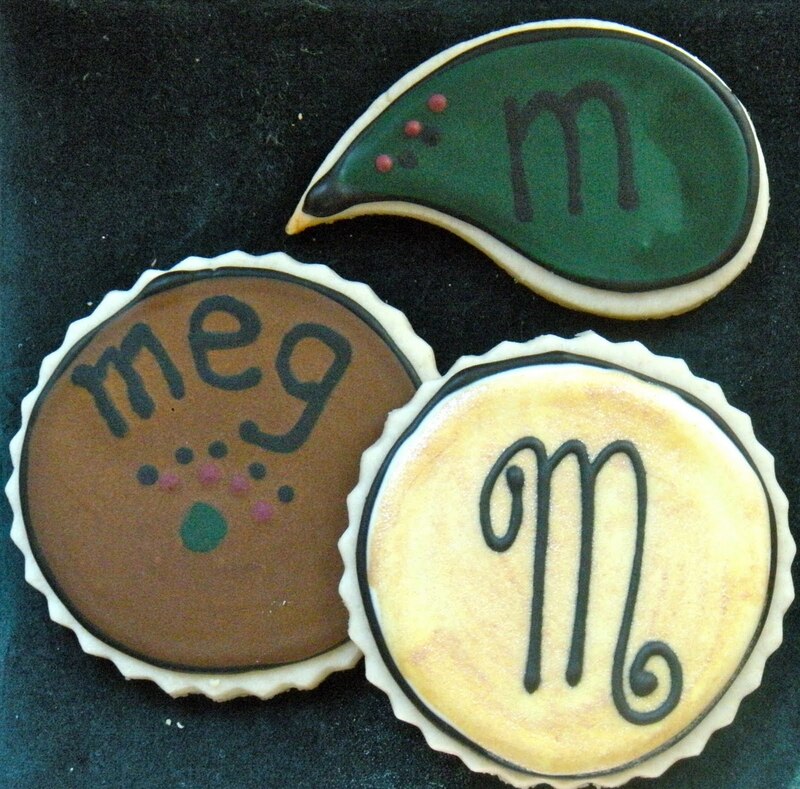 And hopefully Meghan's cookies were okay because Priority Mail took almost 10 days to get to her! I experimented with a new meringue powder, and the dark green was kind of blotchy. I was not terrible pleased. But the taste was actually better than the other meringue powder I use! And finally a few cookies for Thanksgiving. I will be baking up more of these in the last week and change before turkey day! And then it is all about jingle bells and elves! I can hardly believe the season is upon us! It's time for another Secret Recipe Club! My last two Secret Recipe blogs have really been pretty easy for me to choose what to make, but this month I was really overwhelmed! First off, Barbara from Barbara Bakes is yet another long lost soul mate, and stalking, er, reading dozens of posts on her blog, was really quite fun. She is a Mass Comm major, (me too) obviously a cook, baker, blogger and her photo shows her in a Tuscano apron. I may own one very similar to that! She had some great things to choose from, but when I read her post on Short Ribs, I knew I found my recipe. Her husband raved about them, and after our amazing dinner at Bottega I knew Scott would appreciate my attempt at short ribs. She used a recipe from Simply Recipes and served hers with caramelized onion mashed potatoes, but I decided to make Parmiagiano Truffle Fries like we had at Bottega. The first big change I made in this recipe was that I brined the ribs first for about 4 hours. If you have never brined your meat, you are missing out! I am no chemist, but I look at it like this, after you drink too many margaritas and eat too many chips and salsa, you retain water...sort of the same idea. Brined meat is amazingly juicy and tender. If you choose to brine just one thing, brine your Thanksgiving turkey. You will thank me later! I used a half cup of the Williams Sonoma brine dissolved in enough water to cover the short ribs. I only cooked 6 ribs instead of 12, and my other change was that I first served them right from the oven instead of chilling the cooked ribs overnight and skimming the fat off. My hubby works at home, and if I had these braising all day and he came down from the think tank for dinner, and I gave him a turkey burger, well, he'd be a little unhappy. To compensate, I upped the baking time and lowered my oven temp. We took a walk after dinner to keep the cholesterol moving! To be fair, we ate the leftovers the next day after taking off the hardened fat, and warmed them stovetop. Scott decided they were even better. Here is the recipe. from Barbara Bakes, that she got from Simply Recipes! Preheat oven to 300°. 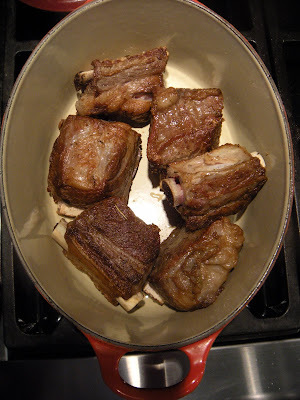 Over moderate heat, heat the olive oil and brown the short ribs (patted dry) on all sides. Work in batches so the pan is never crowded. Remove from pan, and saute the onion, celery and carrot in pan until browned. Remove, and deglaze pan with the wine and reduce liquid by three quarters until thick and syrupy. Return short ribs and veggies back to pan. Add the stock to cover the ribs. Bring to a boil, cover and bake for about 3½ hours. They should be fork tender. So this is new for me, I don't fry often. I followed the Napa Style recipe pretty close. I sliced the potatoes thin, like match sticks, a perfect job for a mandoline. Then I soaked them in ice water because this apparently makes them crispy. I am not a frying expert, so I took his word for it. I fried them first in 325° oil and drained them. Then before serving I fried them crispy in 375° oil. 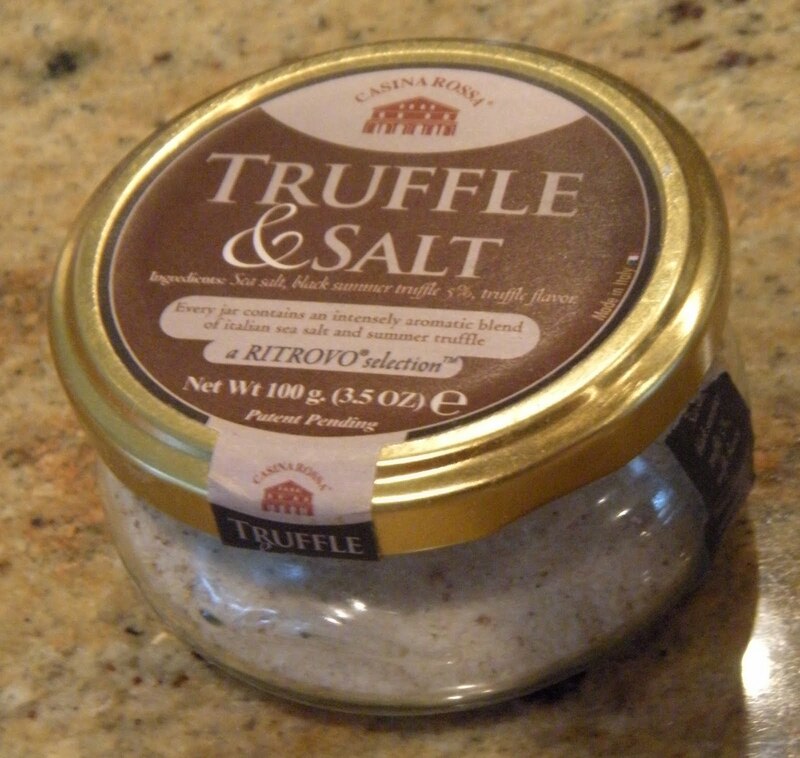 I do not keep truffle oil on hand, which is what they drizzle on the hot fries at Bottega. So I used Truffle & Salt which worked beautifully. Top with the cheese and serve with the short ribs and a nice glass of red wine from Chiarello Vineyards. Ahh, reliving my vacation! Thank you Barbara Bakes, I am coming back to make Mardi Gras King Cake which looks delicious and is a great Mardis Gras staple in this part of the country, but I have never made my own! Also check out the other reveals in the Secret Recipe Club below.So, what are you waiting for? Get in there and cook! So Halloween is just a memory, and I have no candy to rummage through. No Take 5 Bars, no Hundred Thousand Dollar Bars, no Dark Milky Ways. Oh well, my new blue jeans will be thankful. So growing up we had this day off school, All Saints Day. It is the day to remember the loved ones who have passed. In the Mexican culture, it is Dia de los Muertos, Day of the Dead. This day, you tap people on the shoulder to remind them that dying is a part of living. All a little creepier than Halloween if you ask me. But while I was baking Halloween cookies, I decided to do a few skulls. I had a limited amount of colors made for the cookies and just went with them. 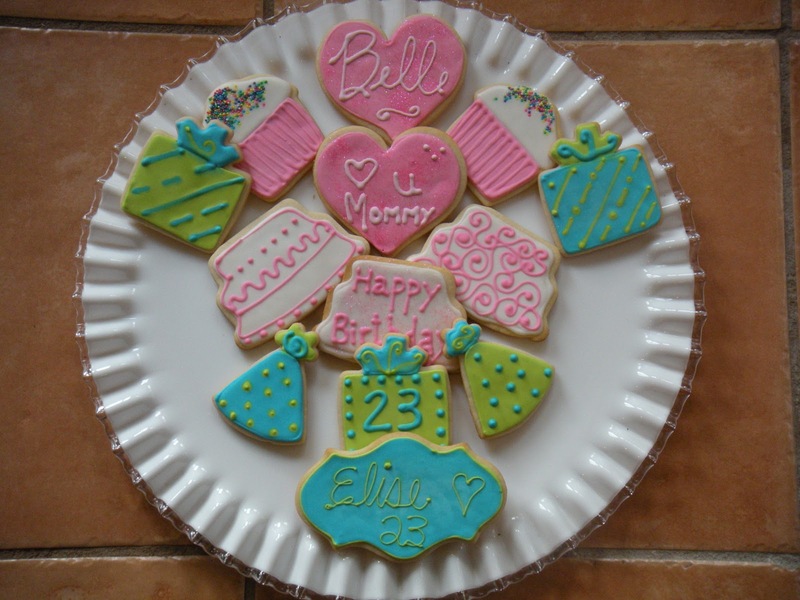 I would have loved to add some blue and red and really went to town, but I am decorating cookies between volleyball tournaments and work. So, here we go, I guess we officially kick off the holiday season. Time to make the Thanksgiving menu and order Christmas cards....what are you waiting for?